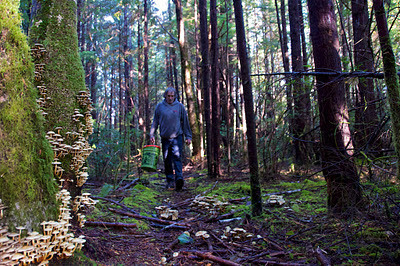 To spend several days with matsutake pickers in Oregon and not come home with even a flag for my efforts was something of a dropped ball. So I spent a day at the coast yesterday picking yellowfoot and hedgehogs plus a few lingering kings and chanterelles—and a surprise late flush of matsi. Yes! They were fruiting on the edges of an old railroad grade in private timberlands where the steam donkeys once worked. 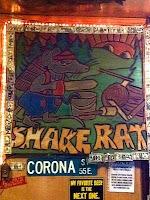 The rusted donkeys are mostly gone now—scrapped by tweakers who have already stolen every catalytic converter they can scrounge—but the Aloha Tavern still waits faithfully at the edge of the cut, a plume of smoke curling out of its wood stove chimney, serving Busch tallboys at the end of the day beneath the conniving grin of the shake rat. 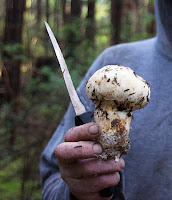 Apparently the coastal matsutake have been infested with cap-worms in a big way this year, but I got lucky with a bunch of nice, fat worm-free mushrooms. Every fall I develop more appreciation for this truly singular mushroom. Recently I learned why I like it more in Eastern preparations than in Western: unlike mushrooms favored by French, Italian, and other Western culinary traditions (think porcini, chanterelle, morel), the flavors in matsutake are water-soluble (as opposed to fat soluble). This is why these mushrooms respond so well to soy, sake, and rice vinegar rather than butter, cream, and cheese. When matsutake is on the menu I usually stick to traditional Japanese dishes, such as Sukiyaki and Gohan. This time I went with spicy Sichuan. For those keeping score at home, since picking up a copy a year ago I've been working my way through Fuchsia Dunlop's Land of Plenty, a treasure trove of Sichuan recipes, adding my own forager's twist. Let's see. So far I've made Fish-fragrant Geoduck with Morels, Dry-fried Chicken with Fiddleheads, Sea-flavored Noodles with Porcini, and a few Kung Pao dinner party dishes with geoducks and morels that disappeared before I could get photographs for the blog. This recipe is based on Dunlop's Chicken with Vinegar, with a few tweaks. Obviously the inclusion of matsutake is the biggest change. Also, I added dried red chili peppers and substituted chili bean sauce for pickled chili paste (which I'd like to try next time). The textures of the three main ingredients—chicken, matsutake, and celery—work in harmony, with all of them velvety smooth but with varying resistance to the tooth. 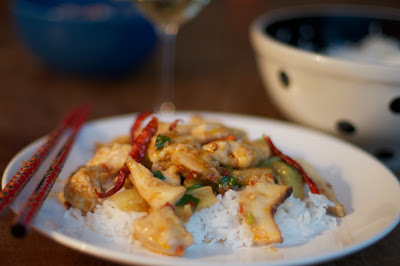 The egg-battered chicken is tender as all get-out, and the matsutake mushrooms make an aromatic accompaniment that is in keeping with the original recipe, their spicy flavor mixing with the chili peppers and black vinegar in a way that amplifies the overall dish. I guess everyone liked it because there were no leftovers. 1. After dicing chicken, mix with marinade in a bowl. Set aside. 2. Mix the sauce in a small bowl. 3. Add batter ingredients to marinated chicken and stir well in one direction. 4. Heat 1 1/2 cups peanut oil in wok over medium flame. Add the chicken and then the celery. Prod with chopstick to eparate chicken pieces and cook until just white. 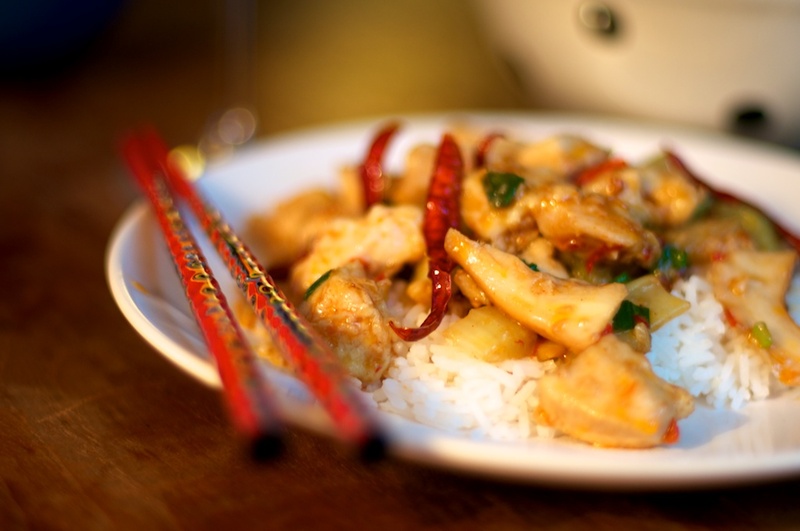 Remove chicken and celery from wok with slotted spoon. Drain all but 2 to 3 tablespoons of oil. 5. Return wok to high heat and add matsutake. Cook 5 minutes or so, stirring occasionally, and then remove with a slotted spoon. 6. Add chili sauce to wok, stirring, and cook 30 seconds. Stir in garlic, ginger, and chili peppers and cook another 30 seconds before returning chicken, celery, and matsutake to wok. Give the sauce a quick stir and add to wok. Cook all together another minute or two until sauce thickens. Serve immediately over rice. Serves 4 with rice and another dish. Looks delicious! Can't wait to learn more about mushrooms so I can go hunting! congratulations!! what a rough season for matsutakes in washington. your dish looks great. i made a sukiyaki with a hedgehog mushroom found in quilcene. hedgehog is probably better used as a water-soluble 'shroom, no? Loving your blog! I hope its okay that I plan on sharing you with my blog readers as much as possible! 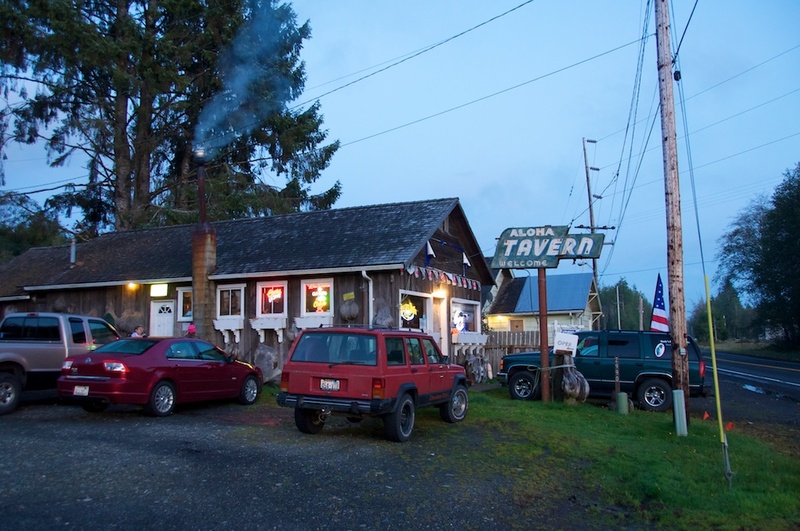 I do seasonal local Northwest and West Coast foods and you are quietly my hero! 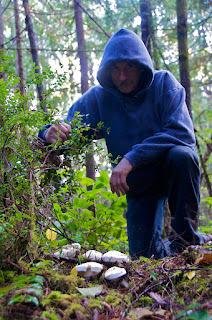 JacLynn - The zombies don't care for shrooms, except for the poisonous false morel aka brain. Greene Treats - I think of hedgehogs as more of a fat soluble shroom, in the same category as chanterelles. In fact, any recipe with chanties can substitute 'hogs--and now is the time to get them in WA. Anna - By all means! 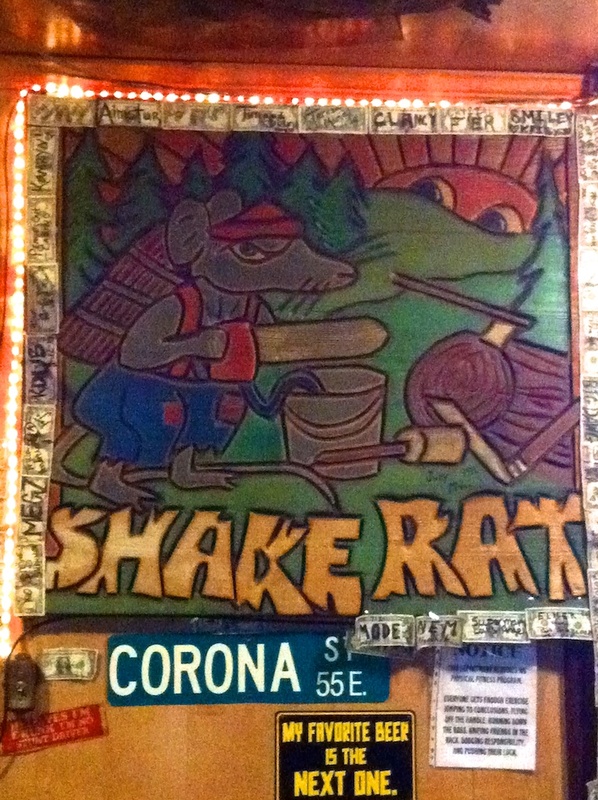 Share and share alike. Cheers! 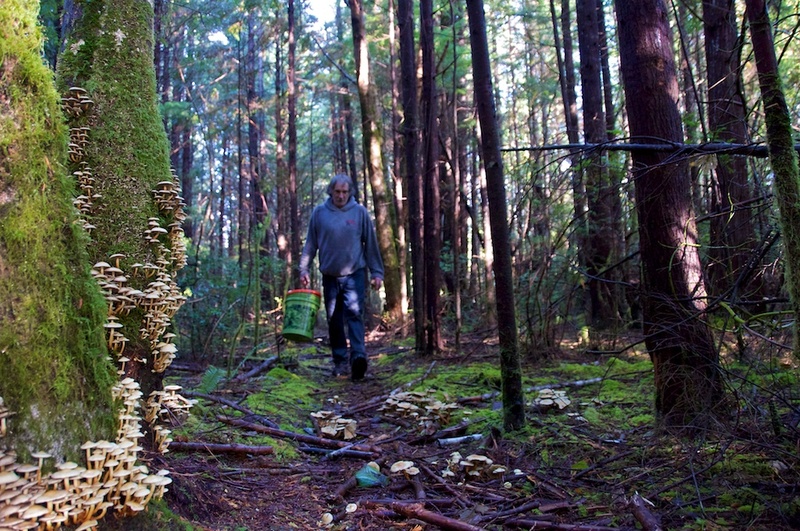 Does the picker you profile have an agreement with the private landholder to pick mushrooms on their property? Also, I have never found hedgehogs in WA state, but I gather they mostly grow on the coast? K Lambert - The timber companies have a color-coded road system: green-dotted gates are open to recreation, red-dotted are closed. I'm not sure about the rules specific to commercial mushroom harvesting within that system. A permit might be needed. Hedgehogs mostly fruit on the coast, but I have some good mountain patches too. I love that you're cooking from Land of Plenty - It's my favorite cookbook and I've made dozens and dozens of dishes from it. I'm curious: What do you use for Dou Ban Jiang? It's very hard to find good Dou Ban Jiang which uses fava beans instead of soy here in Seattle. The one brand I knew of seems to have discontinued the fava bean version - so I went to every market in the ID and bought every single jar I could find! Other than that I've used Youki brand which you can get at Uwajimaya, but it's VERY expensive. I will have to keep an eye out for hedgehogs, then. On the east coast (NJ) they appear in the late summer in oak/maple forest. Probably too late for the mountain patches, as I'm sure it's all frozen up there. What can you do with matsutakes that have worms in them? Throw the out? Such a disappointment after finding a bunch only 2 were worm free!